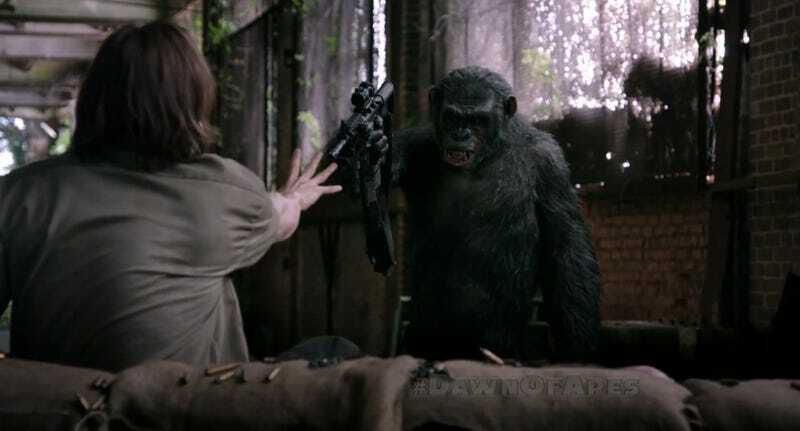 The scariest ape to ever fire a gun while grinning may return to the Planet of the Apes franchise. Or at least director Matt Reeves really wants to leave that door open. In an interview with website M TIME, Reeves was asked why we never really saw Koba's demise on screen. Turns out, it was all intentional. You're one of the few people to ever mention that. That's pretty funny. Because I struggled with – I thought that Toby Kebbell gave such an incredible performance. And I thought he was so powerful and I thought God you don't find a villain who has got that great a story. Because as you said he was not really formed as a villain, he's really a tragic figure. And I thought God, he's amazing let's leave open the possibility, let's create the door of a possibility if we find a story that becomes worth telling that we can go down that path again because I thought the vein was so rich. And so I actually had been working on a version where you could actually see him survive and I realized that it wasn't – it was Caesar's movie and it was undercutting the whole idea. It sort of felt cheap. And so as we were mixing I was like I want to just leave one tiny Easter egg right at the end. I want to leave open the door just the tiniest crack. So you found the crack. Who knows if there will be room for this great villain in the future movies, but we certainly hope there is. Hey, Koba could go off and build his own nation! The Koba nation of apes who love guns and horses but hate humans.